… lived by the sword, die by the sword … hah! 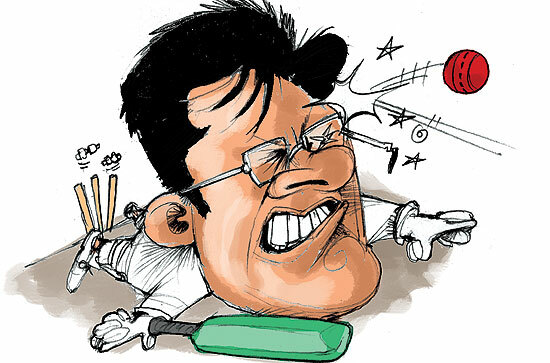 | The "silly points"
« IPL | turning a blind eye? … lived by the sword, die by the sword … hah! I cannot believe that there are people who still believe Modi is all innocence or because of the success of IPL is irreplacable and should be allowed to continue. Set aside his previous criminal activities – his journey into Indian cricket itself is tainted. He conned his way into the Rajastan CA with the help of a BJP CM – and then into BCCI with the help of an NCP MP; by helping Pawar in his power struggle against Dalmiya. Once in BCCI, this mentor gave him a free hand to do whatever he wanted no questions asked. There is talk of the BCCI and IPL governing council’s failure to notice the irregularities. it is more likely they were threatened into silence by Sharad Pawar. BCCI iclaims to be promoting cricket as a charitable activity, and so is exempt of all taxes. Then how could Sharad Pawar let Modi launch as a subsidiary to BCCI the IPLwhich is purely a business. Using the BCCI cover to kill of competition from ICL, the true form of professional cricket. We expect every business to pay full taxes. Why should Modi not have to pay taxes on the crores of profits that he rakes in along with the shareholders? For three years he has cheated us, every Indian tax payers. We say he had free security; free my foot. The security for every match came from our pockets. The cost of keeping the floodlights on when the rest of the country suffers in the heat and darkness. Tell the AI passengers that their delay was a sacrifice in benefit to Lalit Modi. His every crooked deal was with the assurance of Sharad Pawars protection. He became too confident of his importance. He tried to muscle out a Congress MP – who also wanted a slice of the pie for his girl friend. He ‘twittered’ him out of office. He must be stupid to believe the Congress party would not hit back. And boy have they hit him back good. He must be even more stupid to believe his godfather Pawar will risk his own position to save him . Hah! Lived by the sword, now die by the sword. I am a realist. I will remind myself that whatever Lalit Modi did, he did it only for himself, his friends and relatives and the franchise owners, not for cricket and not for cricket enthusiasts. and filed under and tagged BCCI, india, IPL, lalit modi. Play the ultimate fantasy cricket game for the 2010 T20 world cup ! US contestants could win a free air ticket to any place. Go to http://www.lhcricket.com for more details. i think.. no matter what… modi does deserve an opportunity to explain.. Thanks for dropping by J.Sharma. I do agree that he has a right to be heard. And he has been given the opportunity to reply within 15 days. But it would have been ineffective if he had chaired the meeting himself – for he would have been alleged he had controlled it to his benefit. Being suspended, he appears before a panel which is not under his control. Saying that, iI would be surprised if he can find any justifiable defense against the charges.